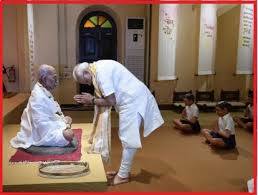 The Prime Minister, Narendra Modi, today inaugurated the Mahatma Gandhi Museum in Rajkot. The Museum has been set up at the Alfred High School, which was an important part of the formative years of Mahatma Gandhi. It will help spread awareness about Gandhian culture, values and philosophy.The Prime Minister also unveiled a plaque to mark the inauguration of a public housing project of 624 houses. He witnessed the e-Gruh Pravesh of 240 beneficiary families. Speaking on the occasion, the Prime Minister said there is so much to learn from Mahatma Gandhi. Gujarat is blessed that this is the land that is so closely associated with Bapu, he added. Noting that Bapu was concerned about the environment, the Prime Minister said that inspired by Gandhi Ji, we have to work for a cleaner and greener tomorrow. The Prime Minister recalled that Bapu always taught us to think of the last person in the queue, the poorest person, and serve the underprivileged. Inspired by this ideal we are serving the poor, the Prime Minister added. Through our initiatives we want to transform their lives; we want to build homes for the poor, the Prime Minister said. It has been over seventy years since Independence, but Bapu’s dream of a Swachh Bharat remains unfulfilled, the Prime Minister said. Together, we have to fulfil this dream, the Prime Minister exhorted the people. In the last four years we have covered significant ground in the Swachh Bharat Mission but we must continue to do more, the Prime Minister said.